Last July, I chanced upon a lecture by Professor Choe, a famous Korean Darwinist, in a seminar for the mutual development of the medical school and the university hospital. The professor expressed his disdain for the Darwinian phrase “survival of the fittest” and instead argued that “survival of the fitter” was a more appropriate expression. This phrase was originally coined by the philosopher Herbert Spencer long before Darwin adopted the words to explain his theory of natural selection . Here, the word “fittest” brings to mind images of the strongest, the most aggressive—we are led to imagine scenes of a violent struggle for survival in which the winner takes all. The “fittest” are the most fertile, the cleverest, or the most cooperative, who in Darwinian terms are “the form that will leave the most copies of itself in successive generations” [1,2]. Yet the course of natural history has shown that this perception is not necessarily correct, for it is not only the fittest that have survived. Through cooperation and symbiosis, the “fitter” have also managed to adapt to and survive in new, challenging environments. When species cooperate, their chance for survival increases. Evolution is not a race in which only the first three to pass the finish line are rewarded with medals; rather, it is a marathon where finishing matters more than coming in first, and runners must lean on each other to make sure everyone makes it to the end. This message from evolution theory in natural science is one we can take to heart in the field of vascular surgery as well. Modern advances in technology, new materials, and computer science have changed the paradigm of vascular disease treatment. Traditionally, vascular surgeons were the main care givers treating vascular diseases. However, recent developments in imaging and endovascular intervention has invited other vascular specialists to join the treatment of vascular diseases. If we cooperate together beyond our turf specialties, we can offer optimal patient-tailored treatments with the best results. This is the goal of the journal ‘Vascular Specialist International’ (Vasc Specialist Int, VSI), as the name suggests—we aim to invite all vascular specialists, regardless of their expertise and establish a platform for cooperation. I hope VSI would be the first-choice journal in vascular specialties. This year, many international editors have joined the editorial board of VSI to improve the quality of this international, peer-reviewed, open access journal. The new editors of VSI have redefined the aims and scopes of the journal, as shown on the first page of the printed version. VSI is open to everyone involved in the diagnosis, treatment, and/or prevention of vascular diseases. VSI aims to encourage multidisciplinary approaches to vascular diseases by all vascular specialists, including vascular surgeons, interventional radiologists, interventional cardiologists, angiologists, vascular technologists, and nurses. Vascular specialists with a profound knowledge of diseases and advanced therapeutic skills are required for the modern practice of vascular diseases, and this journal aims to provide a space for sharing new knowledge between these specialists, irrespective of their affiliated departments. VSI also seeks to provide knowledge of vascular diseases from all around the world, especially—but not entirely—in Asia. The journal deals with disease characteristics from different ethnicities and backgrounds, including epidemiology, clinical manifestation, and treatment outcomes in different populations. The journal also welcomes challenging and informative case reports or innovative technical notes, through which authors can share different experiences and demonstrate how everyday practices are performed in the real world. The reason why we write scientific articles, edit, and publish the journal is obvious. We do this because we are all vascular specialists, endeavoring to make accurate diagnoses and help patients suffering from various vascular diseases. We need to self-evaluate clinical cases and results so that we can facilitate discussions with other specialties about the unmet clinical needs of patients and find new ways of treating these diseases. The history of the journal VSI is quite long. 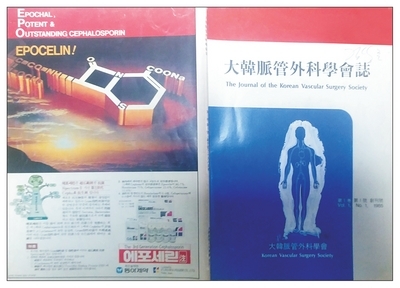 The journal VSI was first published in 1985 under the title ‘Journal of the Korean Vascular Society’ in Korean. Previous editors had done their best to build up an excellent journal in the field of vascular surgery. The list and pictures of the editors emeriti are posted on the second page of the journal to commemorate their tremendous efforts over the years. Cover images from previous years are displayed in figures 1–5 and depict the evolution of the journal. The editors would like to encourage all vascular specialists in the world to actively participate in the journal by submitting an article, making a peer-review, editing, or subscribing to the journal. We need to take a step forward together to become a premier journal in the field of vascular specialties. On a final note, I would like to express my sincere appreciation to all editors, staff members, reviewers, and authors for their great devotion to the evolution of Vascular Specialist International. Seung-Kee Min has been the editor-in-chief of Vasc Spec Int since 2019. Fig. 1. Journal of the Korean Vascular Surgery Society (1985–1998). Fig. 2. 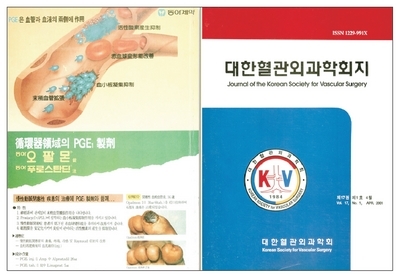 Journal of the Korean Society for Vascular Surgery (1999–2006). Fig. 3. 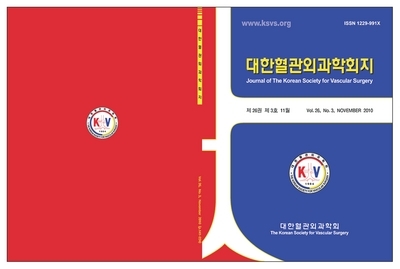 Journal of the Korean Society for Vascular Surgery (2007–2010). Fig. 4. Korean Journal of Vascular and Endovascular Surgery (2011–2013). Fig. 5. 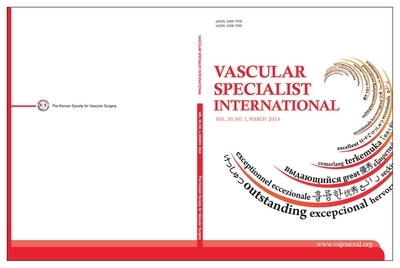 Vascular Specialist International (2014-).